Hello Doodlebug fans! It's Monique today sharing my projects created with the new "Sweet Things" collection. If you know me a little bit, you'll know that my favorite color is red and my favorite color combination is red with pink (with sometimes a bit of orange and yellow). And that's one of the reasons why I adore this collection! The colors are awesome and I can see myself using this collection over and over again. 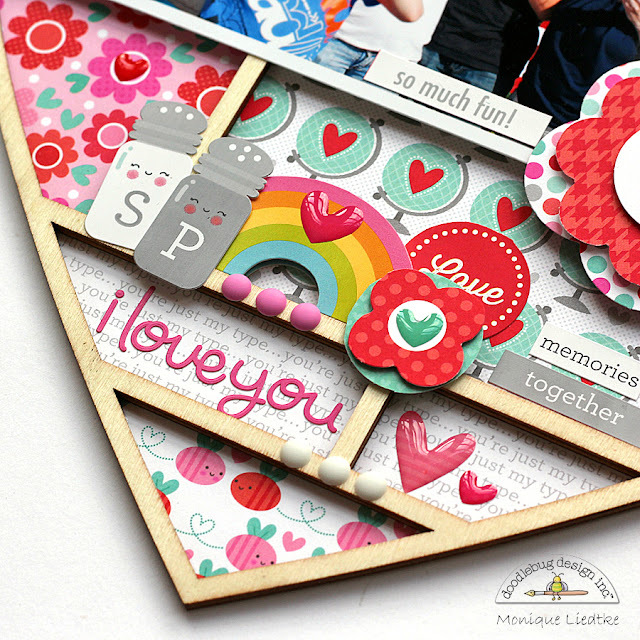 Here's the first project I created: I dressed up this wood veneer heart which I had in my stash waiting for the right collection to come along .... ! The photos were taken in June last year, when we hosted a "welcome home" party for my daughter, who had been away in The States for almost a year. We set up this little photo booth and everyone at the party had to have their photo taken. We had so much fun! I used lots of different patterned papers, (alphabet) stickers, die-cuts & enamel dots. I love that the sprinkles (dots) are "matte"! But the shiny heart shaped sprinkles are just perfect too! 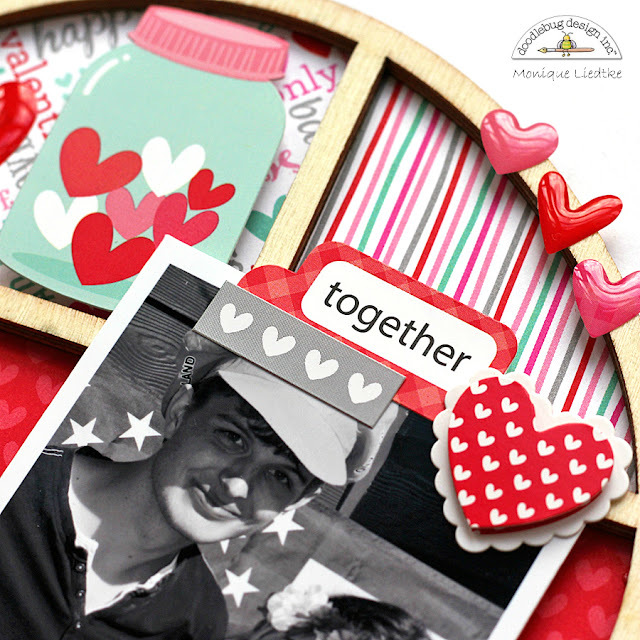 I also love that jar-with-hearts sticker and had to include it on my project somewhere. And because at the time I kept thinking I'm never going to let her leave again, especially for such a long stretch of time, I chose the "we belong together" sticker. 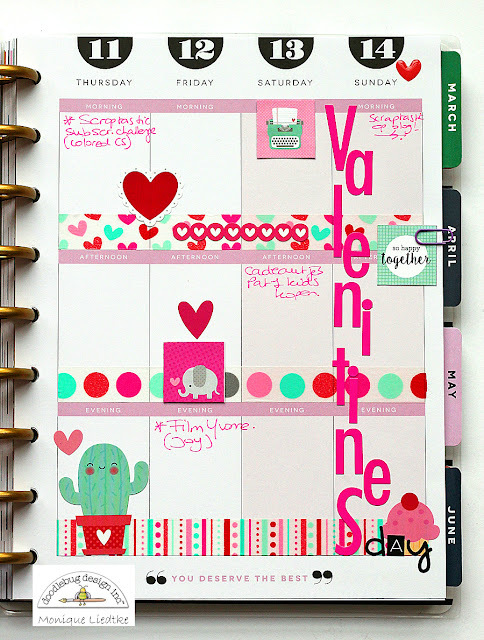 And then my second project: a week in my planner! 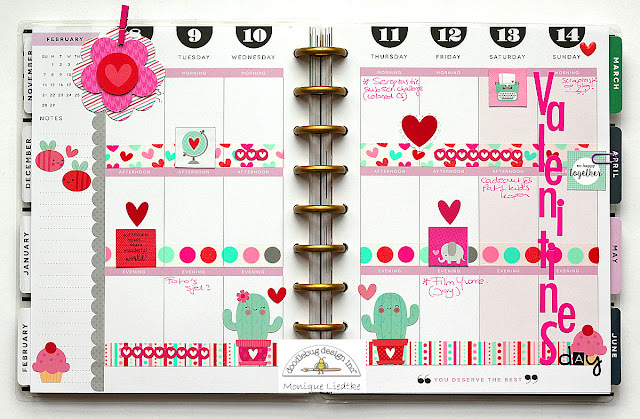 Have you been bitten by the planner bug too? For me it took a while but now I love working on my planner. I just have to be careful not to cover the entire pages, but to leave some space to write notes! I used papers, stickers, die-cuts, alphabet stickers, washi tapes, a mini paperclip, a mini clothpin, I just couldn't choose and decided to use the lot! The little squares are cut from the "Tiny Valentines" sheet (6x6 paper pad) and are the perfect size for a planner. 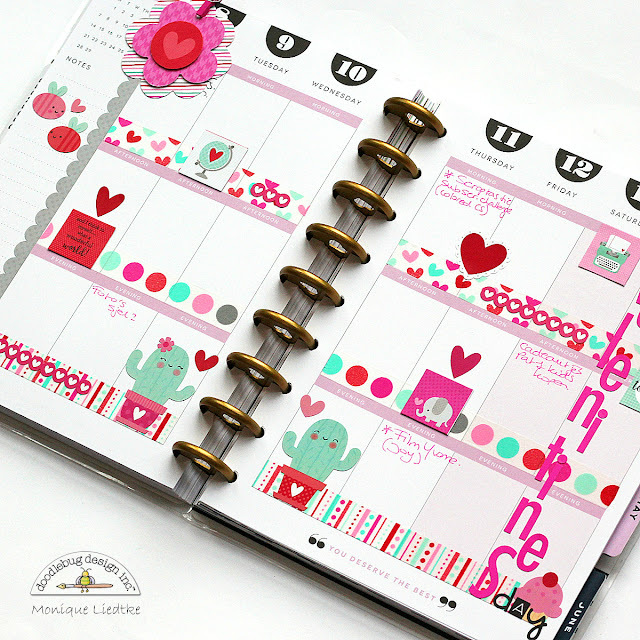 For the word "Valentines" I used the Skinny alphabet stickers and for the word "day" I used some Tiny Type alphabet stickers. 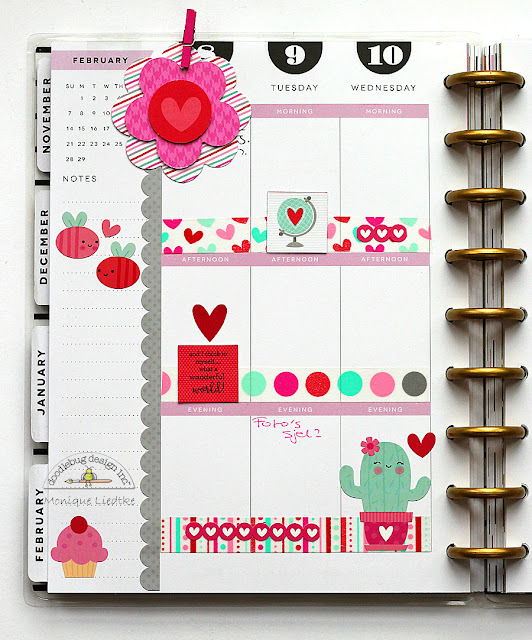 The "Happy Hearts", "Delightful Dots" and "Lovely Lines" washi tapes in the Sweet Things collection are just what any planner needs! 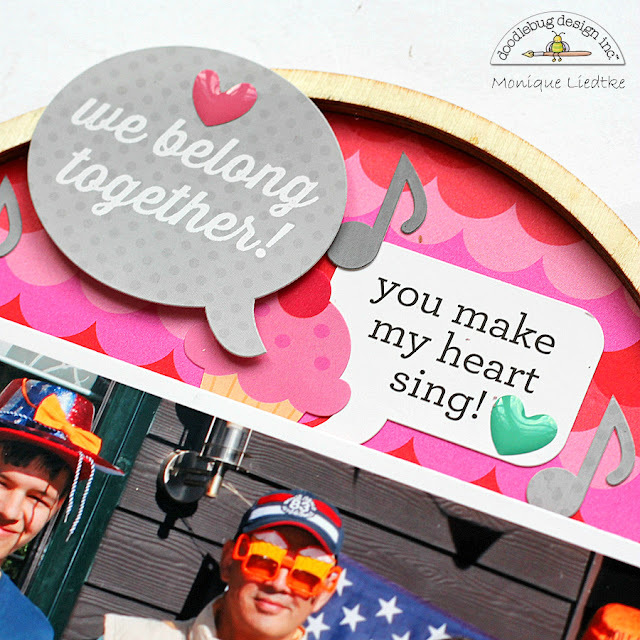 Thank you so much for stopping by our blog and I hope I've been able to inspire you a bit! 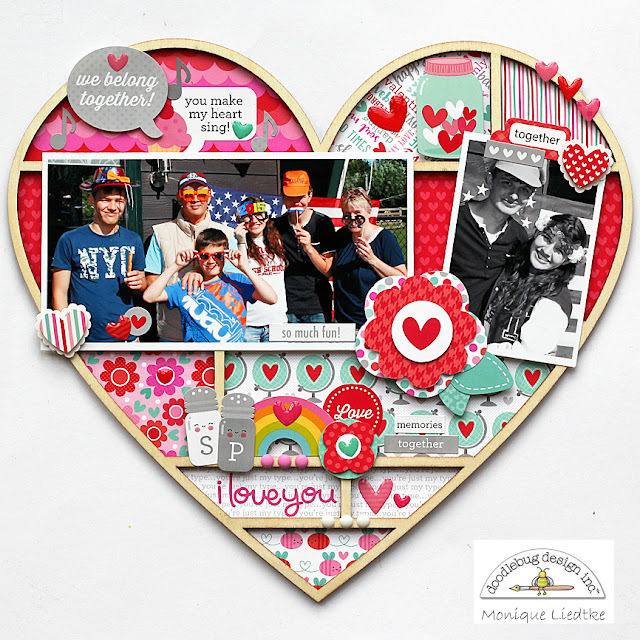 LOVE that heart frame Monique!! And your planner looks awesome! Monique, wat heb je een mooi hart gemaakt! Heb je al een plekje gevonden om hem op te hangen? You rocked these projects Monique! Beautiful work! Wow! Beautiful projects! Love your planner spread!